Lemurs, such as this young ring-tailed lemur (Lemur catta), are found only in Madagascar. Photo by Brooke Crowley. 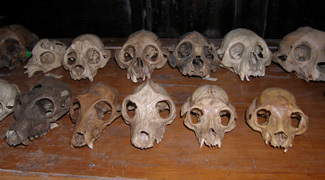 Skulls of extinct lemurs. At least 17 lemur species have gone extinct in the past 2,000 years. Photo by Brooke Crowley. The disappearance of one species does not necessarily allow remaining competitor species to thrive by filling now-empty niches, according to a new study of extinct and living lemur species in Madagascar. The study suggests that the factors driving lemur species extinctions for the past 2,000 years have also sparked an ongoing "ecological retreat" by surviving species. At least 17 species of lemurs have vanished from Madagascar since the arrival of humans about 2,000 years ago. New research by a team of scientists from UC Santa Cruz and other institutions examined eight of those extinctions, and the findings show that surviving species don't necessarily benefit when their competitors die out. Instead, the remaining lemur species appear to have been forced into ecological niches that were largely unoccupied by lemurs in the past. The study, published online May 23 in Proceedings of the Royal Society B, suggests that ecological retreat can result in new selective and ecological pressures that then increase the extinction risk of surviving species, potentially creating an "extinction cascade." Lead author Brooke Crowley, now an assistant professor of anthropology and geology at the University of Cincinnati, conducted the study for her doctoral thesis at UC Santa Cruz, where she earned a Ph.D. in ecology and evolutionary biology (as well as master's degrees in Earth sciences and anthropology). At UCSC she worked with Paul Koch, professor of Earth and planetary sciences, and anthropologist Nathaniel Dominy, now at Dartmouth College, both of whom are coauthors of the paper. The other coauthors are Laurie Godfrey of the University of Massachusetts, Amherst, and Tom Guilderson and Paula Zermeño of Lawrence Livermore National Laboratory. "Beyond its implications for the ecology and conservation of lemurs, this research shows the power of the historical approach to ecology," Koch said. "Scientific observations over the past few centuries are rich in details, but they're typically made on species or ecosystems that have been highly altered by human actions. With information from deeper in time, we get a more complete view of the range of interactions and behaviors that a species is capable of, and we can study how they respond to climate change, extinction events, or introduced species." 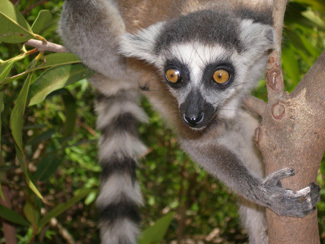 Using radiocarbon and isotope analysis from fossils of eight large-bodied lemur species that have died out in Madagascar since the arrival of humans, the research team was able to determine the type of habitat in which lemurs in the past lived, their diets, when they died out, and whether other still-extant species filled vacated environmental niches. The findings show that prior to extensive human disturbance, lemurs were very common in Madagascar's open habitats of wooded savannah and spiny thicket, which constitute the majority of southwestern Madagascar today. But after the larger-sized lemurs that once inhabited those regions went extinct, related species that existed then and are still extant today could not fill the empty niches. Instead, still-extant lemur species have shown, over time, an increasing reliance on habitats with dense forest cover. "The reasons behind the increased reliance on densely forested habitats are uncertain, but it's likely that low hunting and logging pressures in forest reserves are contributing factors," Crowley said. She added that while forested areas have experienced human disturbance, even greater disturbance has been documented in the unprotected open, drier areas where lemur species once flourished but have gone extinct. According to Godfrey, it's not that lemur species of the past two millennia did not live in forested areas at all, nor that today's species live only in forested areas. Rather, lemur species were once very common in drier and more open habitats in Madagascar, so species were not so heavily reliant on forest habitat as they are today. "It's been assumed that lemurs were in the forests because that's where the resources that best suited them were," Crowley added. "Our fossil analysis shows that lemur species once preferred a much wider, more distinctive habitat range, which may mean that modern lemurs prefer the densely forested areas simply because these areas offer greater protection. The forest is more of a refuge." If so, this could help explain previously reported findings by other researchers indicating "mismatches" between lemur anatomy and observed behavior of modern lemurs in the dense forest environments. Such mismatches could be indications that today's lemurs are in ecological retreat and at risk if conservation and environmental management efforts don't take into account what were once, and may likely still be, their preferred habitats. "In other words," Crowley said, "we now have long-term historical data, a broadened historical perspective indicating that what lemurs are doing today--preferring densely forested areas--is not representative of their ecological niche over past millennia. That's an indication that we need to rethink our assumptions on their current habitat choices and on our own conservation efforts. And this form of historically informed research can also be applied to other locales and animals to benefit threatened species." This research was funded by the David and Lucille Packard Foundation and the University of California Laboratory Fee Research Program, with additional support from D.A. Burney, University of California. Significant laboratory work for this research was conducted at UCSC and Lawrence Livermore National Laboratory.